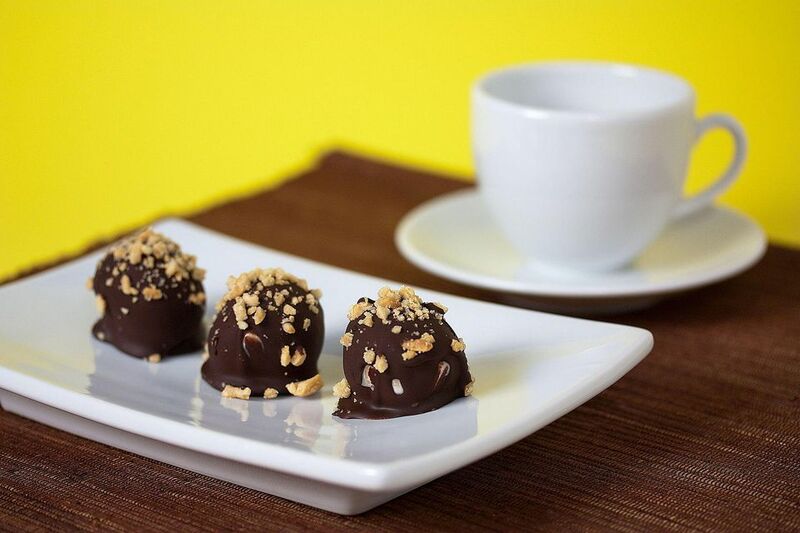 Peanut Butter Chocolate Truffles are an easy recipe for elegant chocolate truffles bursting with peanut butter and chocolate flavor. This recipe calls for them to be dipped in chocolate candy coating, but you can simplify the recipe and roll the centers in chopped peanuts for a faster alternative. Once the chocolate has melted, add the peanut butter and stir until the mixture is entirely smooth. It may not look like it will come together, but keep stirring and you will eventually have a smooth, shiny chocolate mixture. This is your “ganache,” or truffle base. Cover the top of the ganache with a layer of cling wrap, and place the bowl in the refrigerator until it is firm enough to scoop, at least 4 hours or overnight. Return the balls to the refrigerator to chill while you melt the chocolate coating. Place the chocolate candy coating in a small bowl and microwave until melted, stirring after every 45 seconds to prevent overheating. Once the coating has cooled a bit, remove the tray of truffle centers from the refrigerator. Using dipping tools or a fork, dip a center into the melted chocolate until it is completely submerged. Remove it from the coating and allow the excess to drip back into the bowl. Place the truffle on the foil-covered baking sheet and repeat with remaining truffles and chocolate. If desired, you can decorate the truffles with crushed peanuts or peanut butter cup candies while the chocolate is still wet. Alternately, you can melt a small amount of peanut butter chips and drizzle the melted chips over the tops of the truffles. Store the truffles in an airtight container in the refrigerator for up to a week.